The Met Office has issued a severe weather warning after a large burning, sphere was spotted in the sky this morning. The bright shining thing is thought to be the cause of a severe nationwide heatwave, which has seen temperatures everywhere rocket way above the safe level, and into double figures. 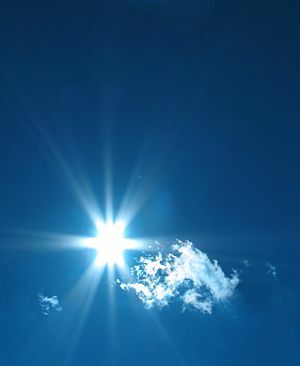 Professor Hamish McEyebrau, from the Slough School of Sky Scrying, said “Across the country, our fluffy charcoal-grey sky appears to have been replaced with a blue so shockingly bright that it will quite probably destroy your retinas if you look right at it. Posted on June 3, 2013 at 10:44 am in Environment, Satire, Science and Nature	| RSS feed You can	trackback	from your own site.